It was all Greek to them. No, literally. I left off in my thread on the general historical backdrop to the main story in my forthcoming book with a nod to Hellenism. That is because my main characters, Hannibal (Carthage) and Scipio (Rome), clashed, with consequences for us today, during the third century BCE, the height of the so-called Hellenistic era. This may sound weird. Hellenism is named after Hellas, Greece, but what we know about this epic clash is that it happened between the two superpowers of the day, Rome and Carthage. What does Greece have to do with this? This is what I want to explain, briefly and simply, in this post. “Greece” was never, in antiquity, a country. Even Homer, writing about the Trojan War that was the mythological foundation for all Greeks, never once used the word Greeks! (Instead, he called the Greeks Argives, Achaeans, Aetolians, and so on.) During the Classical era, the Greeks had independent city states (Athens, Sparta, Thebes etc) that constantly fought against, or allied with, one another. But although they never thought of themselves as a country, they always thought of themselves as a civilization. The definition of Greekness was simple: if you were allowed to send competitors to the Olmpic Games, you were Greek. And who was allowed? Broadly, those who spoke Greek. All other languages sounded to the Greeks like “bar bar bar bar”, hence barbarian. Then, in the fourth century BCE, something big happened: While the Greek cities kept fighting each other about rather petty things, as usual, a new power rose to the north. This was Macedonia. Whether the Macedonians were Greek was at first controversial, but might made right, and Philip, then his son Alexander, became not only Macedonian but also Greek. Alexander, completing the dream his father had dreamt when he was murdered, then swept ferociously across the Hellespont to the east, reversing the direction of the earlier Persian invasions, and conquering most of the known world. In the process he brought Greek language, culture, philsophy, theater, art and architecture to the entire “Middle East”. His name lives on in many garbled city names, such as Kandahar. What did this mean? It meant that in the whole Mediterranean and “Middle East”, there was one cosmopolitan, urban culture, which was Greek–ie, Hellenistic. There were lots and lots of other peoples–Phoenicians, Romans, Gauls, Numidians, Illyrians etc–who abutted on this Greek pond from all sides, and they each had their own culture and language. But the haute couture, the lingua franca, the aesthetic style, the entire outlook and sensibility of the era–all this was Greek. There are no perfect parallels in history for this astonishing cultural dominance. The reach of Han Chinese culture during the Tang Dynasty and “Anglo-Saxon” culture today (from English-as-a-second-language to Hollywood films) are the two that seem to come closest. So there. Hannibal spoke Punic, Scipio spoke Latin, but both of course also spoke Greek. Scipio, in fact, loved Greek culture so much that his political enemy, Cato the Elder, a sort of Roman Joe McCarthy, even tried to spin a scandal out of it. It was a culturally refined and complex era. A fascinating era. You’ve heard of Pyrrhic Victories, which are defeats disguised as triumphs–in other words, Kipling-esque impostors of the sort that I will be describing in my book. But do you know why they are called that? It’s thanks to Pyrrhus, who is well worth five minutes of your time. Pyrrhus was the ancient world’s equivalent of a dumb jock whom all the girls loved, who bashed the equivalent of Budweiser cans on his forehead and beat up the enemy football team but never quite figured it all out. Put differently, he was the King of Epirus in northern Greece, and wanted to be like Alexander the Great, who died a couple of generations before him. (Pyrrhus in turn died a generation before Hannibal was born.) He wanted to be a hero and to conquer. Basically, that’s all there was to it. And he was great at it–brave, courageous, strong. Plutarch says that once, when he was thought dead on the battlefield, he just got up and cleft an enemy soldier in two pieces with one blow of his sword. Cineas: If we beat the Romans, what should we do next? Pyrrhus: Why, then we’ll be masters of all Italy. 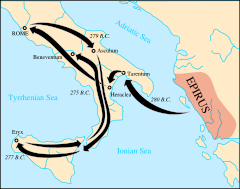 Pyrrhus: “We will use that as the forerunners of greater things” such as Libya and Carthage. Would anybody resist us after that? Cineas: “And what hinders us now, sir,” from doing exactly that? At this Pyrrhus was nonplussed. But left for Italy anyway! Eventually, as he was wont, he got distracted. There was another opportunity for glory in Sicily, so he sailed around a bit there and bashed a few heads. You can see on that map what that trip (dare I say his life?) looked like. In any event, Sicily also failed to make him happy, so eventually he made his way back to Greece. Once home, he kept fighting wars here and there. I mean, it’s a hard habit to kick! His end came as it had to come (irony alert): He was in the middle of some vicious street fighting in a Greek city, when an old woman on a rooftop dropped a tile, which landed on his heroic pate and knocked him dead. So it goes, as Vonnegut would say. Have you ever been a Pyrrhus in your life? Do you know any Pyrrhuses?